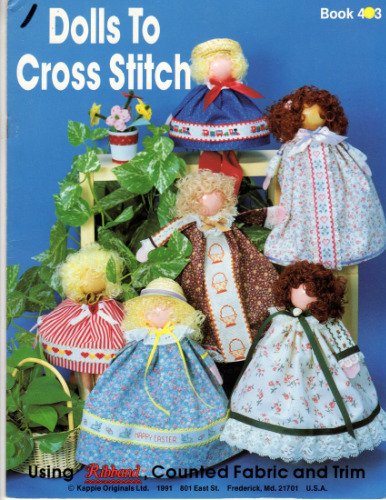 Kappie Originals Dolls to Cross Stitch counted Cross Stitch Pattern booklet. I Love You Doll, Flower Basket Doll, X and O Doll, Happy Birthday Doll, Hearts and Flowers Doll, Teddy Bear Doll, Red Floral and Heart Doll, Hearts Doll, Tulip Doll, Train Doll, Halloween Doll,Flower Border Doll, All Over Heart Doll, Easter Doll, Rose Doll, Christmas Doll, Blue and Peach Doll. Appears new.